Please refer to our stock # 13009 when inquiring. Georgian 18K yellow gold "fede" ring of clasped hands and plaited hair. 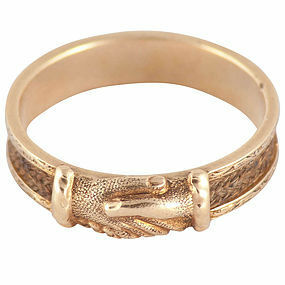 The clasped hands are a symbol of fidelity and commitment and were often used on wedding bands. This ring is between a size 4 3/4 and 5 and measures 3/8" wide.